Although we recently got hit with over 2 feet of snow, believe it or not, spring is just around the corner and it is time to start thinking about your outdoor living spaces. There’s no denying the appeal of great deck designs but, there’s a choice to be made in what material to use in building that deck. The two most popular materials are pressure treated wood and Trex (composite decking material). So, what exactly are these two materials? Pressure treated wood undergoes a chemical process that helps the wood withstand the elements and wards off insects, microorganisms and fungal decay. During the pressure treating process, wood is saturated with a water soluble chemical. Composite decking material, like Trex, typically consists of various types of plastic that is mixed with wood particles. Composite deck designs used to be sold with a claim that they were ‘maintenance free’. However, this claim has since been changed to ‘low maintenance’. One of the main reasons for this change is that composite decks, although very durable, are still susceptible to outside elements. For instance, mold can grow on all surfaces and pollen can cover a deck just like it does your house and car. In terms of cleaning composite material, pressure washing, or detergent applied with a soft brush, will rid the surface of most mildew, pollen, and other debris. Mildew left for long periods of time, however, might require a deeper cleaning technique. It is important that you don’t use bleach because this can fade the deck. Instead, if mold detergent doesn’t do the trick, choose a cleaner made specifically for composites, or hire a professional deck cleaner qualified to treat tough stains. Wood deck designs require upkeep and most will need to be sealed and stained. Most professionals recommend sealing and staining the wood every three years. For interim maintenance, if the deck becomes dirty or covered in pollen, it is best to use a soft bristle brush and mild detergent to clean the wood. Avoid power washing because this can strip the wood. 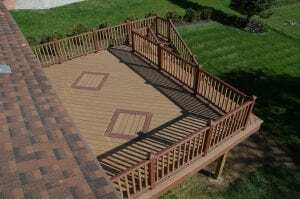 Although in most cases the cost of a deck constructed from composite material is almost double one made from pressure treated wood, the durability of this material makes it worth every penny to some homeowners. Composite can last up to 50 years, and most manufacturers, like Trex, offer either a 25-year or limited-lifetime warranty on structural integrity. Some warranties are even transferable from one homeowner to another. 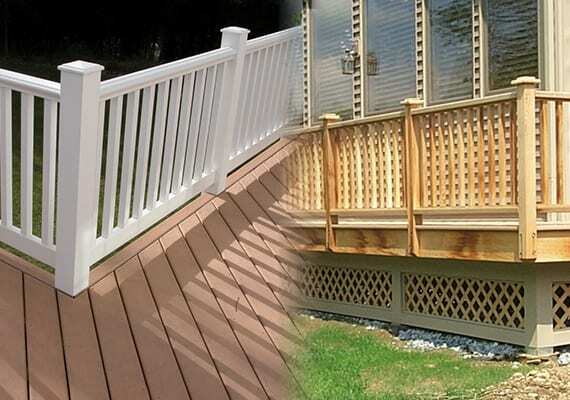 Most composite manufacturers also offer everything you need to finish deck designs like fascia boards, railings, balusters, treads, posts, etc. These finishing touches are made in the same color using the same composite material to help pull it all together. Pressure treated wood, on the other hand, only lasts about 10-15 years with no warranty. From afar composite decking material resembles real wood and depending on the color, painted wood. Many homeowners considering composite often ask if the material can be painted when it fades and/or when they want to change the look. The answer to this question varies. Some companies do sell paints specifically for composites. However, prior to attempting such a task, speak to the manufacturer of the deck you purchased as well as a professional painter. 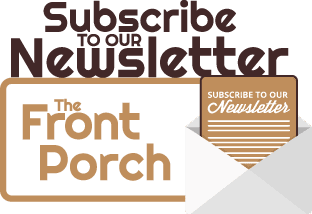 You’ll find numerous horror stories on the Internet from homeowners who, facing a faded composite deck, painted with a product that ended up peeling within a year or so. If you love the authentic look of real wood pressure treated wood is the way you should go. It is a necessity to stain and seal your deck to maintain its integrity. 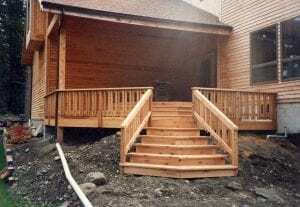 Therefore, you have the flexibility to change the look of you deck at any time. Spring is on the horizon and that means it’s time to think about entertaining outdoors, warmer weather, and watching the sunset in your backyard on your beautiful new deck. Let us help you decide what material is best for your home and your budget. We can help you turn your decking and patio dreams into a reality!